The term “the Latin Mass” is most often used to refer to the Tridentine Mass—the Mass of Pope St. Pius V, promulgated on July 14, 1570, through the apostolic constitution Quo Primum. 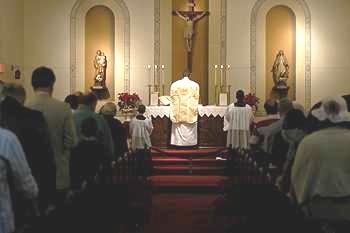 Technically, this is a misnomer; any Mass celebrated in Latin is a “Latin Mass.” However, after the promulgation of the Novus Ordo Missae, the Mass of Pope Paul VI , in 1969, which allowed for more frequent celebration of Mass in the vernacular for pastoral reasons, the term has come to be used almost exclusively to refer to the Traditional Latin Mass—the Tridentine Mass. This Mass is celebrated each Sunday at noon here at St. Mary’s by the Sea.